Geoff Johns and Jeff Katz combine all the expected fun and suspense (and quite a few unexpected surprises) into Booster Gold: Blue and Gold, but the real joy here is seeing artist and Booster Gold creator Dan Jurgens return not only to Booster, but the Jurgens-era Justice League and a couple other 1990s Jurgens creations. Dan has been one of my favorite artists since back in his pre-Death of Superman days, and this second volume of Booster Gold is a nostalgia fan's gold mine. If you ask a crowd to name their favorite Justice Leagues, you'll get a variety of responses: the Satellite era Justice League, for instance, or Keith Giffen's Justice League International; maybe the current Meltzer lineup, or Grant Morrison's Big Seven. One or two fans might even single out the Detroit League. My favorite League, however, spun out of the end of Justice League International, the post-Breakdowns, pre-Death of Superman and/or Zero Hour Justice League. That's right, I'm talking about Superman, Blue Beetle, Booster Gold, Fire, Ice, Guy Gardner, Maxima, and Bloodwynd, as written and drawn by Dan Jurgens. To be a fan of this League, you likely had to be an ardent Superman reader at that time. Superman's leading the Justice League (for, in that continuity, the first time) was a natural offshoot of storylines like Superman: Panic in the Sky, which transitioned Superman from a relative loner and reluctant leader to the frontmost character he is today. Superman's discomfort with Ice's attraction to him (when Lois and Clark's engagement was brand new), his attempts to manage Guy Gardner, and his work to put Maxima on a straight-and-narrow path all overlaid well the Superman stories of the time, culminating of course in the Justice League's involvement in The Death of Superman. The rest of that League, in my mind, encompassed the best of Justice League International. Fire, Ice, Booster Gold, Blue Beetle, and Guy Gardner -- sure, Mister Miracle and Captain Marvel had their moments, but these five always seemed to me the core of the JLI, the ones the stories couldn't have been told without. Jurgens's run put these characters in more superheroic situations than the previous Justice League International, but still kept more humor than the later Morrison or Meltzer runs. Witness this League up against Starbreaker in issue #65 (where I think Blue Beetle defeats Starbreaker despite being "powerless") and their sacrifices against Doomsday; this is an oft-forgotten League, but for me it doesn't get much better. I digress. The point is that Booster Gold: Blue and Gold gives Jurgens a chance to once again draw that League, and in the more than ten years since, Jurgens hasn't lost a step -- his Ice, emerging from her homeland in her 1990s costume, is especially effective (as is, separately, the running gag where Blue Beetle thinks everyone else had been declared dead). Jurgens also draws the Vanishing Point that he used for a long time with the Linear Men (though there's no appearance, unfortunately, by Waverider) and the Zero Hour-era Parallax and Extant. Whether Johns and Katz tailored this story specifically with Jurgens to include all these Jurgens highlights, or whether just happy coincidence, if Dan Jurgens was your favorite before then Booster Gold: Blue and Gold will be a happy reminder now. Not to be left out, Johns and Katz provide a Booster Gold story that, if not quite everything I might want out of a posthumous Blue Beetle/Booster Gold team-up, still delivered some fantastic surprises. I agreed whole-heartedly with the characters about half-way through that Booster's father, even dressed as Supernova, was something of a poor foe for Booster, so I was delighted when Supernova was revealed as Mr. Mind (and I was still taken entirely by surprise despite the preview in Booster Gold: 52 Pick-Up). Also great was the writers' resurrection of Goldstar in the end; having not read the original Booster Gold series, I have no real connection to the character, but given the overall theme of loss in this story, it was lovely to see Booster win in the end. The writers also pull off a great Back to the Future moment in suggesting that Batman's been holding photographs of Booster Gold ever since Barbara Gordon was shot, waiting for all the pieces to fall together. 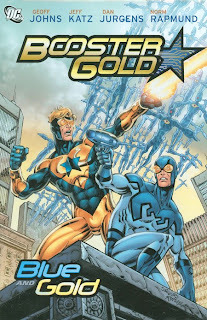 Booster Gold: Blue and Gold moves rather swiftly toward it's inevitable end, and it's unfortunate, as I think we all knew going in, that the story couldn't end with a living, time-lost Blue Beetle (or could it?). But to read Blue and Gold is to read a story that touches Zero Hour and DC One Million, Justice League International and Infinite Crisis -- in short, a filled with more unbridled DC Comics joy than perhaps one hardcover can handle. If you like that kind of thing, then this book's for you. Switching gears now to Birds of Prey, and we're going to run through a whole bunch of new trade paperbacks from there. Stay tuned! I just read this trade again recently. I can't be the only one that sees a hell of a lot of similarities with Flashpoint? Both written by Geoff Johns aswell...can't be a coincidence.